The concept that a wood floor might have a particular “style” has been relatively slow to take hold. Since the 1950s, 2-1/4″ oak strip flooring has been the mainstay of the wood flooring industry; the prevailing idea being that a floor should be perfectly flat and mirror smooth. The prize was a solid deck of clear-grade lumber, uniform in color and void of visual character. A surface as pristine as a hospital and as utilitarian as a roller rink. How times have changed. Today, homeowners, designers, and general contractors are freely imagining floors with personality. They understand that a floor isn’t simply, utilitarian; it’s a predominant element of a home’s design. 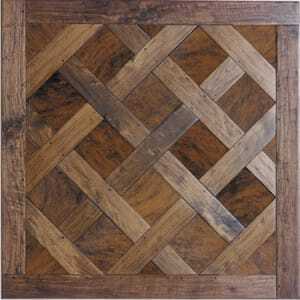 So how does one select the right wood – and the appropriate style – for a floor? The answer: very carefully. There are many options available and the long-term consequences of creating something as permanent as a floor merit strong consideration. A number of factors should be taken into account: character, durability, color, finish, and cost. 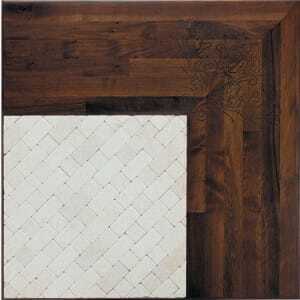 As strange as this may sound, cost should be the least of your considerations when choosing a new floor. The break from traditional oak strips doesn’t necessarily mean a great leap in investment. In fact, the cost of oak continues to escalate while some woods less frequently considered – among them domestic cherry, walnut and hickory – have remained stable. For many, a relatively modest price increase can result in a distinctive look. That alone may constitute a better overall value. And when you amortize the cost difference over the life of a home, it frequently becomes insignificant. 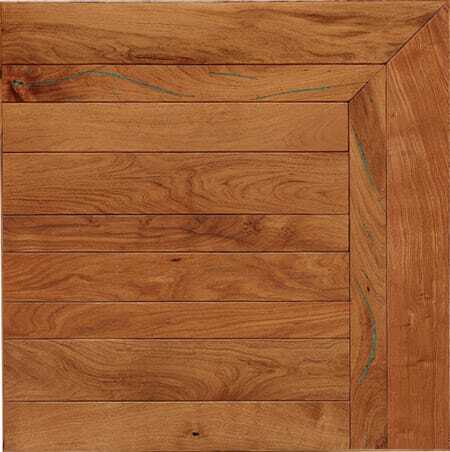 Design style will often determine the choice of wood for a particular floor. Some woods are intrinsically more formal than others. A pristine mahogany, for example, may be the ideal choice for a grand entry but might seem incongruent in a hunt or trophy room. Conversely, a rustic, knotty pine floor in a formal dining room might come across like the crazy aunt at the dinner party. Plenty of character, but out of place. The wood type also dictates the surface style it is given. A clear grade of hardwood with a tight grain pattern will accept and maintain the smooth, unblemished look of traditional elegance longer than would softer woods with more character. In fact, trying to preserve a flawless surface on a less durable species of wood can turn a person into the floor police. (Will your joy of entertaining be tempered by the nagging fear that your virgin pine floor may not always remain so pristine?) On the other hand, a softer wood that records every dent, ding and scratch develops a history over time that can be as personal as the family photo album. It’s a matter of style based on a balance of form and function. Floors with an aged appearance are very popular among my clients. The look is not that of abused wood, but of wood that has been well maintained and has mellowed over years of service. A subtle warmth and gentle patina can be accomplished by hand-beveling the plank edges slightly, by scraping the surface by hand, or by employing any of a number of methods for distressing the surface. In all cases, the “aging” process should be restrained so that the resulting appearance suggests age rather than becoming a cartoon of it. The lower “character” grades of wood – like hickory, walnut or mesquite with highly figured grain patterns – are better suited for this. They lend their own character and texture to the overall effect. 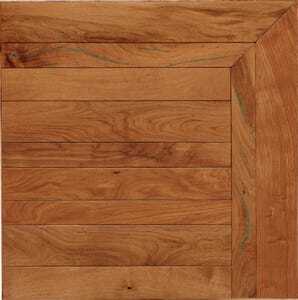 Of course, the alternative to simulating aged flooring from new wood is to start with wood that is actually old. Installing flooring milled from salvaged timbers can impart a sense of history into a home that has yet to record any of its own. Just think, if the tree from which the lumber was originally milled was a minimum of 150 years old, and the structure from which it was salvaged was 100 or more, even a brand new home could have floors that pre-date the birth of the country. Installing old flooring as new flooring, however, can be problematic. If the tongue and groove joint system has been damaged during the salvage process, you might be installing creaks and groans along with your new floor. And repeated sandings during the floor’s previous life will limit future sandings appreciably. Milling new flooring from old timbers, on the other hand, insures boards with full thickness and new joint integrity. Naturally, reclaimed lumber has a special appeal in the environmentally-conscious segment of the market. No new trees have to be harvested and what otherwise would be landfill fodder is recycled into usable material. Another important consideration when selecting a floor is the color you want to achieve. All woods have a natural color and, yes, you can alter that color somewhat with various stains. But some woods accept stain better than others, and it makes sense to start with a wood whose natural hue already works with your design. Visualize how the floor will relate to the overall style of the room. You don’t want to wind up with a tuxedo and brown shoes. The style, wood selection, and location of your floor should help you determine its finish. A wax or oiled finish has a more natural look, particularly on a textured or aged floor. Wax and oil are absorbed into the surface and give a greater depth or patina to the wood. A wax finish requires periodic buffing and re-waxing. What’s more, it’s less practical in wet areas such as a kitchen. And wet mopping a waxed finish is not an option. A polyurethane finish seals the surface of a wood floor like a thin, inert layer of plastic. There are two types of polyurethane: water-based and the more common oil-based. The newer, water-based formulation – though material costs are more expensive – is more durable than the traditional oil-based. Both are available in fairly natural looking matte and satin sheens. Polyurethane finishes need less maintenance than wax or oil, but they don’t respond to spot repair well, which means that repairing a few worn areas may require recoating the entire room. Bear in mind that removing a polyurethane finish is generally not a chemical procedure. When it comes time to do a complete refinishing of a textured or hand-scraped floor, some of that lovely character is going to disappear into the sander. The design of a floor is a serious matter and should be based on practical considerations and individual preferences. Personally, I love the character of antique oak, rustic walnut and mesquite. But I wouldn’t try to influence a client to use any of these woods if they weren’t right for the application. I advise my clients to consider how they’ll feel years from now about the choices they are making today. Will the floor be a source of joy and satisfaction? Of long-term pleasure? Or will it be a constant reminder of compromises made, a source of daily resentment? When you think and choose carefully, and maintain your floor properly, you should expect to enjoy your wood floor for many years to come.